Going to be another relatively short feature page this week, as I write them on the weekends, and this one I’ll be occupied with tour scouting on Saturday and tour giving on Sunday. 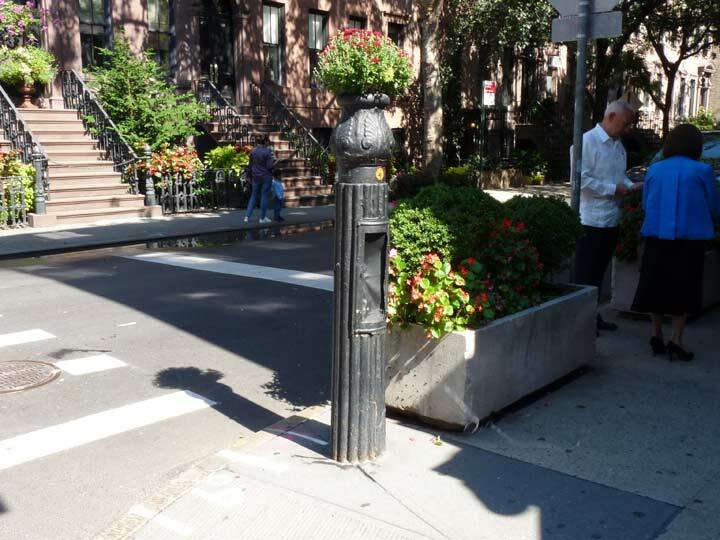 I will use some photos I got from a walk in the village on Charles Street and 11th Street in the Village and East Village on one of the few sunny days in September 2018. The idea for the entire walk came from a very small notation I found on a 1946 Hagstrom map of Manhattan in my collection, that I’ll get into a bit later. 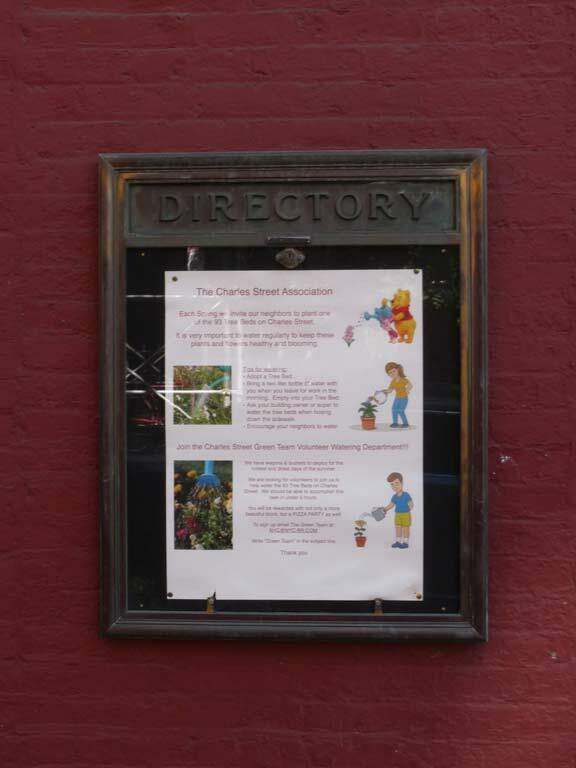 I’ve explored Charles Street for FNY before, but not in the particular context I am going to mention. The great part of a NYC residency is that you never run out of material, and even places where you thought you had said everything there is to say about it — you find you haven’t said much at all. I was fascinated with the way the sun was reflecting on this charming brick building on the SW corner of Hudson and Charles. Like most Village buildings, it’s of great age. 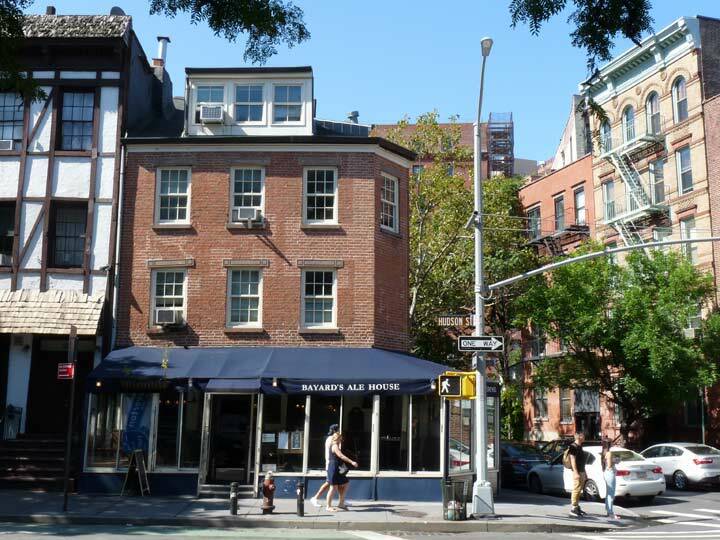 Greenwich Village is one vast Landmarked district–which means buildings are very, very difficult to get permission to tear down, or even to alter in most ways. Nevertheless, there are a lot of newer buildings around, so there’s no restriction that can’t be challenged or gotten around. 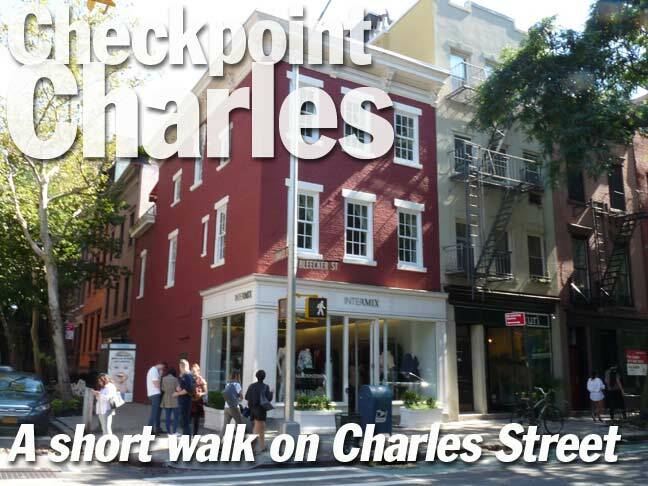 Charles Street, according to two sources, was named for Charles Christopher Amos, who acquired a swath of Village property that had belonged to a colonial-era landowner, Irishman Sir Peter Warren. When streets were run through, two new ones, Charles and Amos (West 10th since the mid-1800s) and Christopher Street, which overlaid the older Skinner Road, got all three of his names. This explanation has always perplexed me, though, since the three are out of order, running south to north, they’re Christopher, 10th (Amos), Charles. Perhaps there’s another origin of these street names. Like the other buildings on Hudson Street it dates back to the 1820s. However, the writer of the LPC Report was less than glowing about the place. 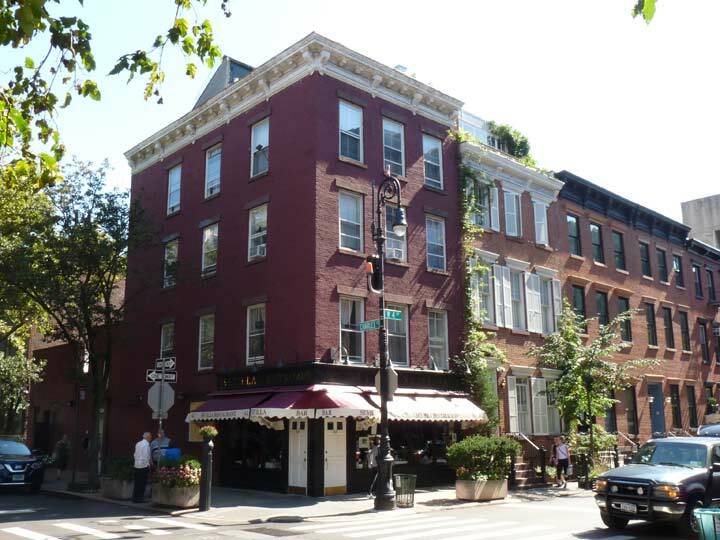 The report was written in 1965–the Village was one of the first Landmarked districts in the city, and thus, the joint may have looked a bit shabbier back then. Note how the proprietors of Bayard’s Ale House must have consulted the LPC Report when deciding on a name! 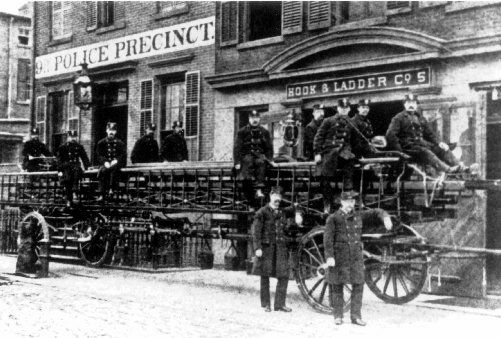 102 Charles Street has gone from a residence, which it was when originally built in 1854, to a firehouse for the Columbian Volunteer Hook and Ladder between 1857 and 1865, and later, FDNY’s Hook and Ladder #5, which is now located at 6th Avenue and West Houston Street. 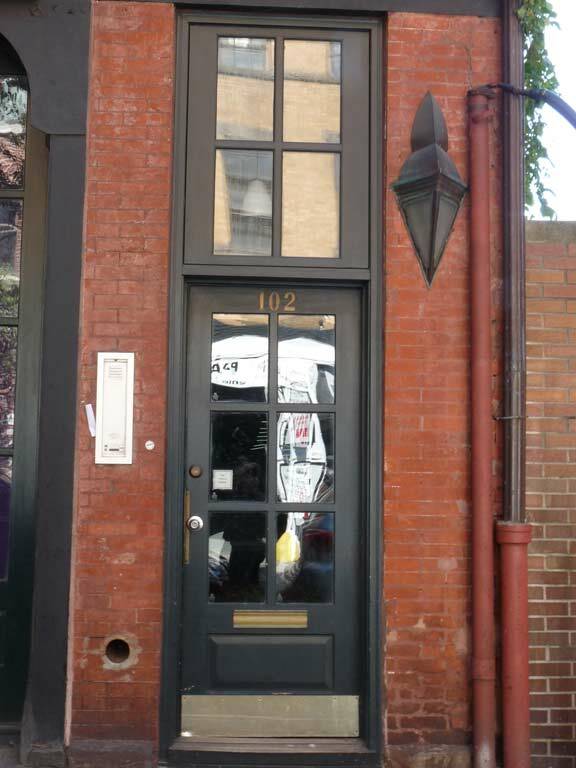 102’s firehouse roots are still evident in its wide front entrance, built to fit fire engines of various sizes. I wonder what vintage that unusual conical-shaped light at the entrance is. Yet another handsome brick structure, elegant in simplicity, at the SE corner of Bleecker and Charles. 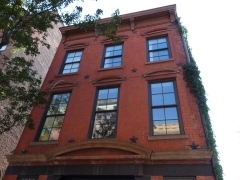 This house is one of several built along Bleecker Street in 1829-1830 by hatmaker James Haslet, who leased the land from trinity Church with a provision that any houses would not be used as factories. The buildings were originally two and a half stories with peaked roofs — all have been altered in varying degrees since. 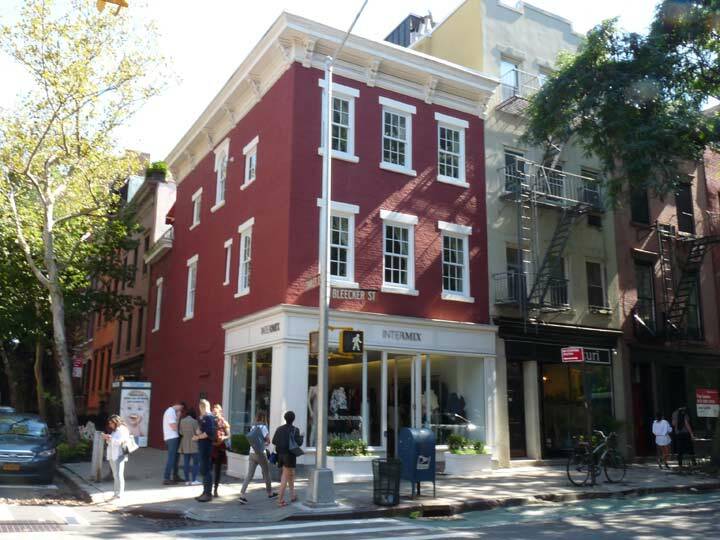 The corner building, #365 Bleecker, was originally a drugstore. A boutique called Intermix now occupies the ground floor, but this framed directory on the Charles Street side hints at an earlier use. I have been paying attention to little details on maps for decades now. The Hagstrom hand-drawn edition of the NYC map, first produced in 1916 and the last in 1999 (editions since then have been computer-assisted design, and much blander for it) will sometimes surprise you with small notations here and there. In the northern Bronx, a Hagstrom “Lourdes of America” notation inspired me to make this fascinating discovery. The 1946 Hagstrom map for Greenwich Village is pretty much the same in this neck of the woods to the one they stuck with till 1999, except for the tiny “Van Nest Place” inscription on Charles between Bleecker and West 4th. This harks back to a very old NYC tradition: several block or blocks-ling stretches of longer routes carry, or carried, separate names. 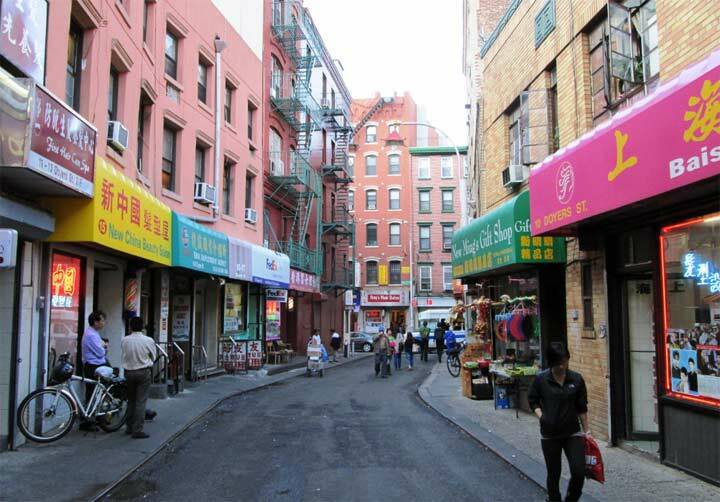 The most obvious one today is the stretch of East 8th Street between Cooper and Tompkins Squares, which has been called St. Mark’s Place, after the nearby church, for over a century and a half. Another is the half-block of Leroy Street between 7th Avenue South and Hudson Street. It bends midway through, and the section of the bend closest to Hudson is called St. Luke’s Place, after the nearby St. Luke-in-the-Fields Church. 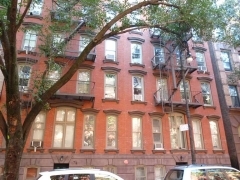 Elsewhere in the Village, West 8th between 5th and 6th Avenues was formerly called Clinton Place. This was land formerly occupied by Peter Warren’s estate in the colonial era. 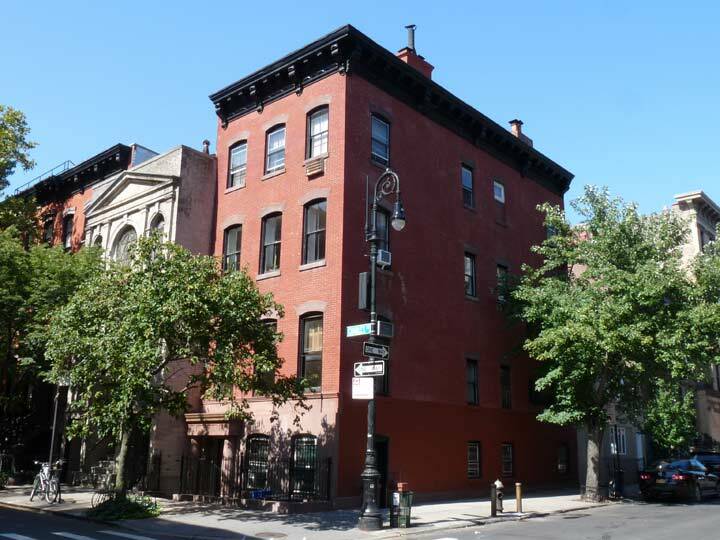 After Sir Peter returned to Europe, his property was sold off, but his old mansion remained where Charles Street was built between Bleecker and Asylum Street (now West 4th). The last owner of this grand edifice was Abraham Van Nest, a merchant and philanthropist who served on the board of trustees of Rutgers College (now University), sat on the NYC Board of Aldermen (today’s city Council) and was president of the Greenwich Savings Bank. When Van Nest passed away in 1864, the mansion was razed and property subdivided into lots, onto which Charles Street’s collection of townhouses shown above on the north side of the street now stand. 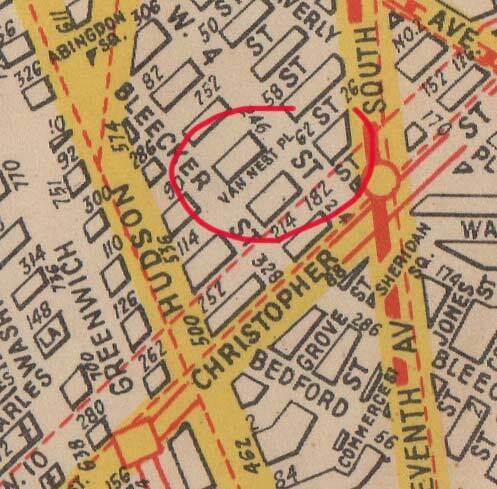 Such was Van Nest’s popularity that the block was renamed Van Nest Place, but it was changed back in 1936 as the city wanted to avoid confusion by the post office with the Van Nest Bronx neighborhood and avenue. 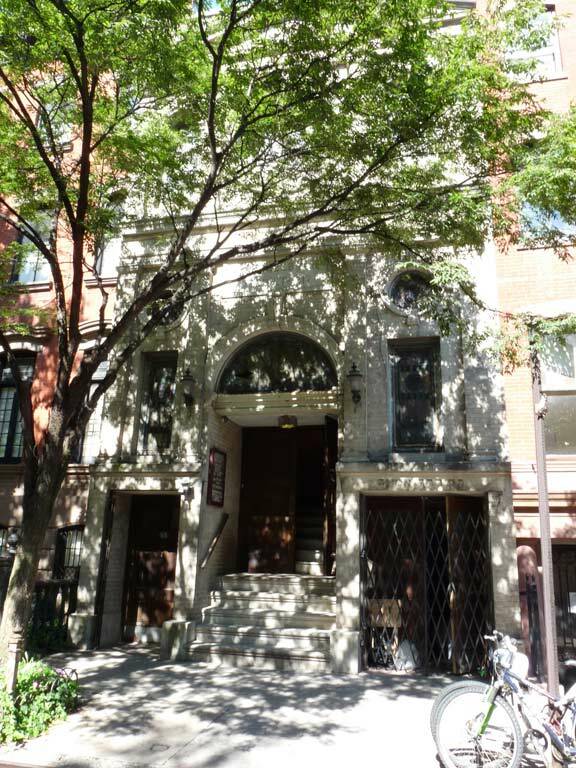 88 Charles Street, on the south side of the street, is a handsome brick mansion built in 1887 in a neo-Greek style. 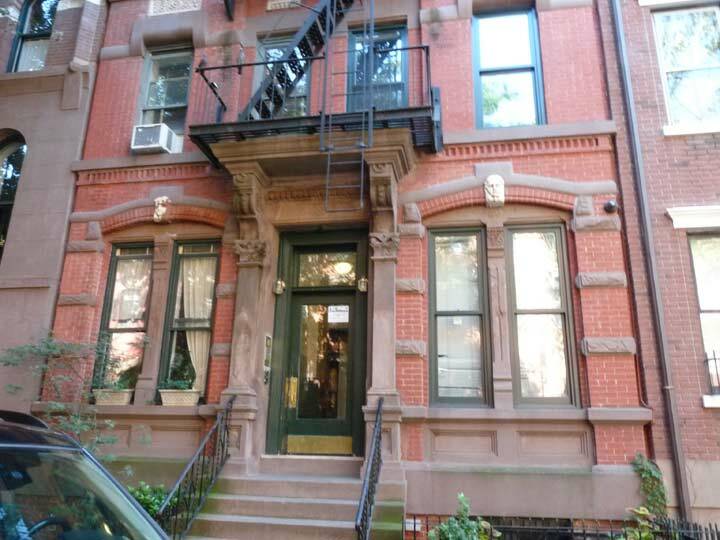 Note the brownstone Corinthian pilasters, or half-columns, at the entranceway. 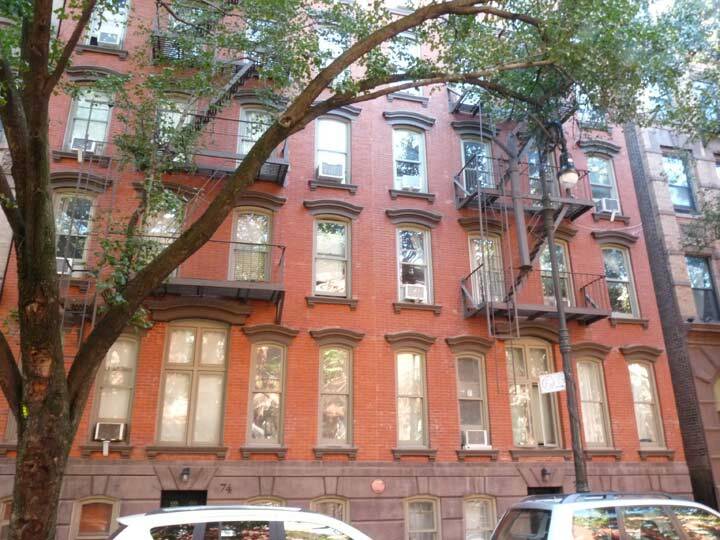 #74 and 76 are a pair of apartment houses built in 1871 and designed by architect Julius Boekell. 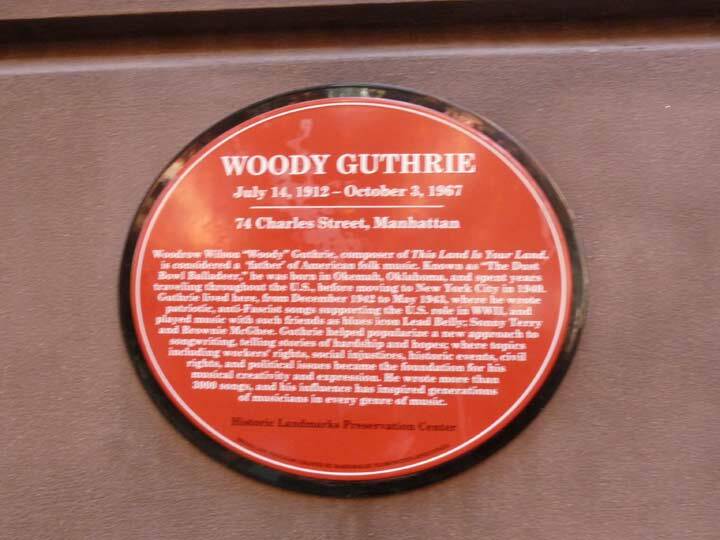 As the historic sign says, an apartment in #74 was briefly a residence from December 1942-May 1943 of famed folksinger and composer Woody Guthrie, who would receive visitors such as Huddie “Lead Belly” Ledbetter, Sonny Terry and Brownie McGhee. 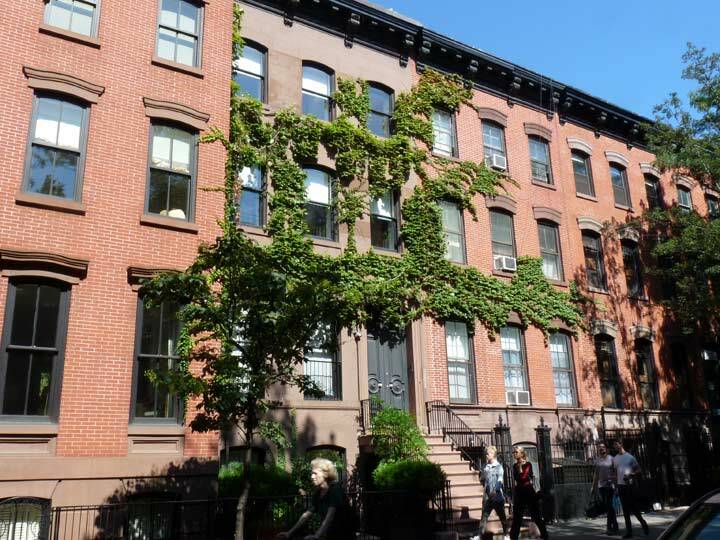 Just about any Greenwich Village block can boast at least one famous resident at one time or another, but this block of Charles Street alone could boast Guthrie, authors Maurice Sendak and Sinclair Lewis and poets Hart Crane and Delmore Schwartz. See the above link to my first Charles Street piece for details on each. 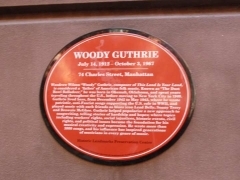 … Established in 1838, the Dutch congregation had moved throughout the 19th Century from Greene Street, to 99 Sixth Avenue, to 7 Seventh Avenue, to 278 Bleecker Street, to a synagogue on West 4th Street, before purchasing the 1868 house on quiet Van Nest Place in 1912. Rather than starting from scratch, architects Sommerfeld & Steckler altered the existing structure. The five-year renovation gutted the townhouse. What resulted was a three-story classically-inspired structure that hugged the property line. The nearly-flat fronted Roman design included a classical pediment and brick pilasters supporting stone cornices between each floor. The colorful stained glass of the dominating rose window, hefty fanlight over the entrance and six flanking windows highlighted the cream-colored brick trimmed in limestone. 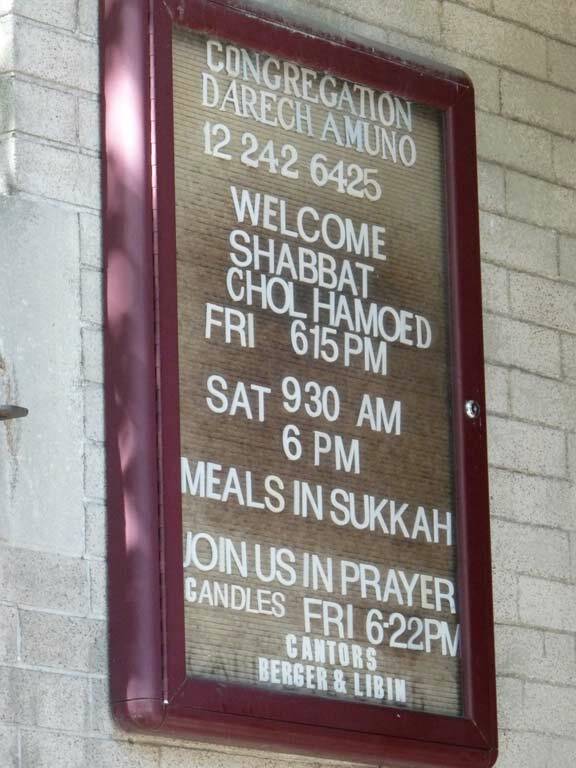 The small synagogue is an unlikely concert venue, offering bluegrass and roots music. Yet another amazing corner building, this one at the SW corner of Charles and West 4th, #62 Charles Street, built in 1828 by Samuel Whittemore with a 3-story height; the fourth was added later on, in 1898. #62 is the longtime home (since 1941) of the Spanish restaurant Sevilla — the restaurant’s website has a lengthy history of the establishment and also the general West Village area it inhabits. There are a couple of infrastructural items to talk about here. The Village is home to many retro versions of the Bishop Crook lamppost. However Spring City, which makes a lot of these reproductions, missed the boat on one aspect–if it was indeed the longtime Pennsylvania manufacturer that created them. Notice the J-shaped pipe that holds the old fire alarm light indicator. Old-time castiron NYC poles had their own dedicated sconce styled to hold these lights, whose reflectors were originally globular in shape. Today only a few examples survive, on a special Type 6 lamp on Warren Street downtown and also on the Type G Corvingtons in Stuyvesant Town. The classic sconces couldn’t have been that tough to copy! The other item is of course this Type 6 BC base, all that survives of a complete post that came down decades ago. Complete versions can be seen on this FNY page. They were bishop crooks, but with different bases and iron scrollwork. They were generally thinner, with narrower bases, and were designed for use on narrower sidewalks and streets. The Sevilla ownership has been using it as a planter for some time now. When I first found it, it was listing at almost a 45-degree angle but has been thankfully righted. 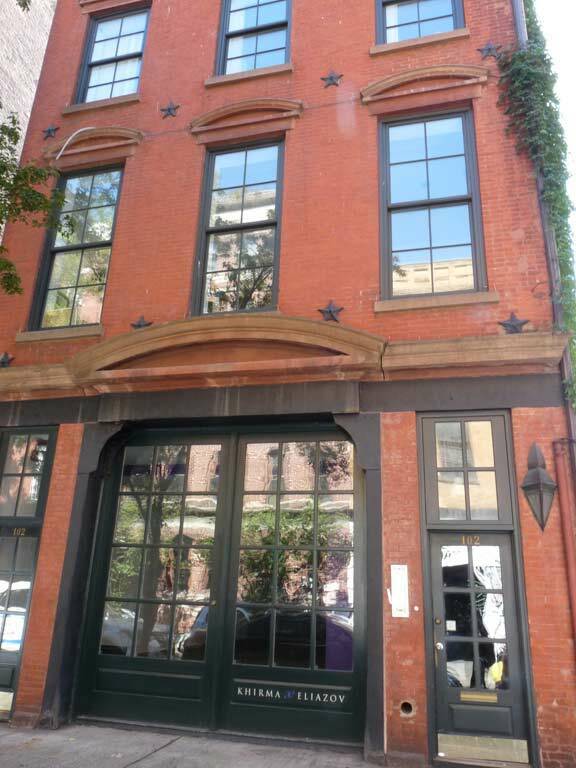 The building on the NW corner of Charles and West 4th Streets is the former #1 Van Nest Place, now #51 Charles. It was constructed in 1867 for Commissioner of Emigration George Starr. There were two identical rowhouses adjacent to it, #53 and #55, that were rented by Starr, who lived in #51. In 1917, the original #53 Charles was razed for the Congregation Darech Amuno synagogue. My Dad’s family lived at 6 Charles St. My widowed Grandmother was forced to move in the early 70s when the building was gutted but the facade had to remain. Ladder 5’s quarters used to be next door to the NYPD’s 9th Precinct before the NYPD moved to the current quarters over on East 5th Street.